Until the palm beach county butterfly ballot had its 15 minutes of fame, few believed that bad design could determine the fate of the world. But then a local election official created a form that confused elderly voters, causing thousands to mark both Al Gore and another candidate on the same form, disqualifying enough votes to put George W. Bush in the White House. 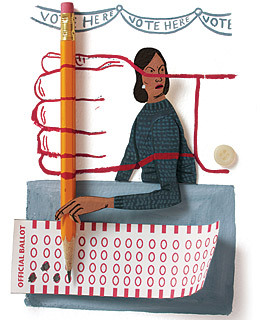 Eight years later, punch-card ballots are mostly a thing of the past, but bad design lives on. This summer, the McCain campaign sent poorly designed absentee-ballot forms to more than 1 million voters in Ohio. The form included a redundant box for voters to check if they were "qualified electors." Though the box was not required by law, the Democratic secretary of state, Jennifer Brunner, rejected thousands of otherwise complete forms with unchecked boxes. Luckily for the voters, the state supreme court stepped in to overrule Brunner's order, which it noted "served no vital public purpose or interest." A lawsuit has yet to be filed in a similar case in Colorado, where Republican secretary of state Mike Coffman, who is running for Congress, ruled that more than 6,400 new registrations should be rejected because people failed to check a box before providing the last four digits of their Social Security number. Again, the box was redundant, since new registrants provided all the other required information, yet Coffman has declared the forms incomplete and sent letters alerting voters that they have just a few days to fix the mistakes or be left off the rolls.